In 2017, for our tenth stamp we look to the promise of our youth and their future. We celebrate the career of Melissa Haney, a young woman who in 2016 became Air Inuit’s first female Inuk captain – a wonderful role model for all young people. Born in 1981, Melissa lived in Inukjuak, Nunavik (Quebec) the hometown of her late father, until her mother’s work as a teacher took her to Umiujaq and Kuujjuaq. As a youngster she knew aviation as an ordinary means of transportation – for medical and dental visits or vacations. For her, flying was quite natural. During flights she now regularly reconnects with friends and relatives. The north is bred into her bone marrow – the howling winds, bleak snowy landscapes, several months of long dark nights, followed by a short period in the summer with no night at all. Like her idol and mentor, Johnny May, the first Inuk bush pilot in Nunavik, Melissa cares deeply for people in Canada’s north, and their cultural history, and does all she can to help connect southerners with them. Melissa’s most memorable flight involved flying passengers from Salluit to an inland camp while “the weather was going down all along the coast”. She eventually landed on an old runway. By luck, some passengers had a cabin nearby. They also had an all-terrain vehicle on board. Some people travelled to the cabin and started a fire, while others went hunting and brought back a caribou. Once the weather cleared, Melissa flew the group back to Salluit. Melissa and her husband Pierre-Olivier, another Air Inuit Dash 8 captain share parenting of their young children, Julien and Olivia, during their 28-day work cycle, each spending an average of 10 days in the air. 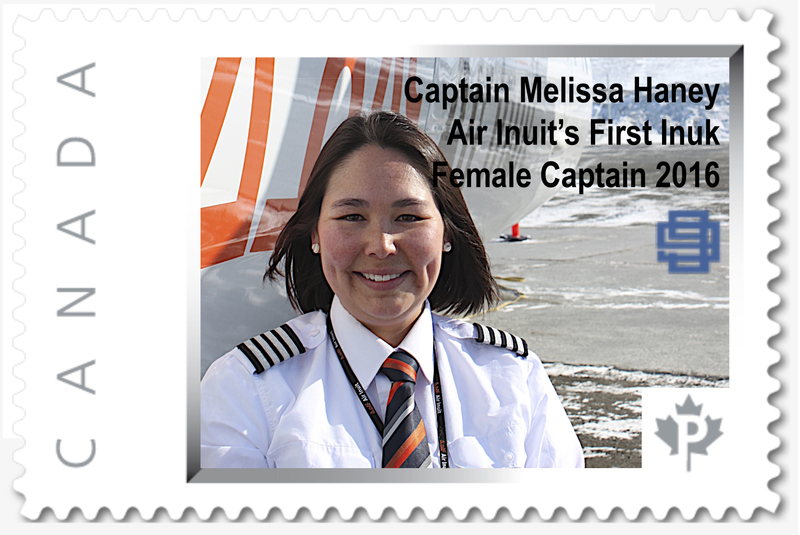 A beautiful design by Suzanne Wiltshire, the Melissa Haney stamp was introduced at Air Inuit’s Montreal facility on August 15, the first anniversary of Melissa being promoted to captain. Profits from stamp sales honour other people and groups’ contributions to aviation, support flying events and preserve historical materials. We invite you to copy and enclose in your mailings this brief bio so more people can learn about this remarkable young woman.